I'm in Oak Ridge, Tennessee, and the gentleman across the table from me is telling me stories about a time when most Americans, including prominent senators, did the government’s bidding because… Well, just because they trusted the government to do the right thing. No bickering. No complaints. Not even any questions. These stories blow my mind. On the airplane en route to Tennessee, I’d read articles about more partisan squabbling in Congress, more defiant businessmen, more people trying to advance their own interests at the expense of others. Now it occurs to me that, except for a few weeks after 9/11, I can't remember a time when the people of the United States were really united. But this gentleman is telling me that such a time existed not so very long ago. “During World War II,” he says, “extraordinary things happened,” and he continues to tell me about the “Secret City” that existed in his neck of the woods. It happened like this: On August 2, 1939, President Roosevelt received a letter from Albert Einstein stating that there was reason to believe Nazi Germany was developing nuclear capabilities. Roosevelt realized that the United States had no choice but to do likewise — and to it faster. Thus was born the Manhattan Project, a massive, top-secret, all-out effort by the United States government to develop nuclear capabilities. Three sites were chosen to be part of the program: Oak Ridge, Tennessee; Los Alamos, New Mexico, and Hanford, Washington. 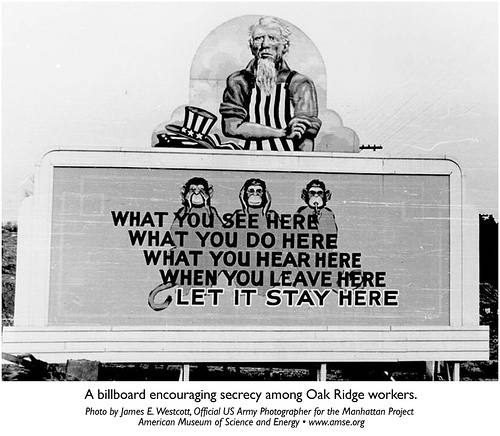 Oak Ridge, a 59,000-acre site in eastern Tennessee, was the first and largest. Three thousand people, many of whom had been forced from their farms just a decade earlier when the TVA built the Norris Dam, were asked to move again so that the government could build a new, ultra-secure city. They did so without complaint, without resentment, without lawsuits. Almost overnight the new city sprung up. Homes, schools, stores and dance halls were built so quickly that children went to school in the morning and got lost going home because the landscape had changed so drastically in just those few hours. At its height, it was home to more than 82,000 people, making it the fifth biggest city in Tennessee, but it was such a well-kept secret that it never appeared on a map. What's more, only a few people of those 75,000 folks knew what was going on inside of their fenced city. People worked hard and played hard, but they didn’t discuss their little piece of the project with family or friends. Billboards based on the folkloric trio of moneys — see no evil, hear no evil, speak no evil — reminded people of the necessity to mind their own business. And they did. As a result, in three short years, the people at Oak Ridge figured out how to produce highly enriched uranium (a necessary ingredient for an atomic bomb), but most of them didn’t realize what they’d done or why they’d done it. They just knew they were serving their country, and that was enough for them. At the same time, 51,000 people in Hanford, Washington were racing to produce plutonium and develop a production-scale nuclear reactor. And another group of people, this one comprised of 3,000 highly educated scientists, were working at Los Alamos, New Mexico. The Los Alamos group was responsible for turning the enriched uranium and plutonium into a nuclear weapon. Their work was so secret that they couldn’t tell anyone where they lived. All mail had to be sent to one address — P.O. Box 1663, Santa Fe, NM — and was later distributed to the various scientists. to detonate the bomb, should the scientists be able to develop it. Vice President Harry Truman wasn't privy to these discussions. In fact, he had been president for two weeks before he was told that the United States had the power to end the war — and unleash a deadly weapon on the world. 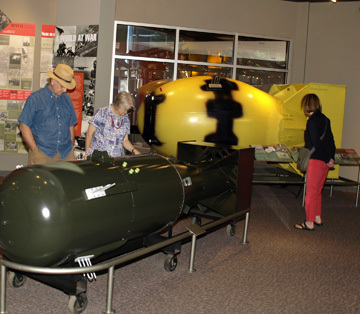 When the folks in Oak Ridge heard that Truman had dropped an atomic bomb on Hiroshima, they were astounded. "So that's what we've been working on," one man exclaimed. Three days later, when the H-bomb was dropped on Nagasaki, many of the people at Hanford were similarly surprised. Only the scientists at Los Alamos and high level officials in Chicago and Washington, D.C. had known what the Manhattan Project was all about. But more interesting than the sites are the questions that people have after visiting them. The obvious — and most heatedly debated —question is should the United States have built, and used, the bombs. But equally as interesting to me, in these days when our country is so vehemently partisan, is that the people of the United States were so unified. They were willing to do whatever it took to win the war — whether it meant authorizing money, keeping secrets, or unhesitatingly doing as they were told. The bigger question, of course, is: Is that a good thing?